This past Friday (January 27th) our Safety Director, Becky Montgomery, was invited to an annual Contractor’s Safety Meeting hosted by CMA & Liberty University for all LU jobs. This meeting requires each contractor working on Liberty University jobs to send a safety representative to recap the previous year and changes that are going into effect for the future year. CMA & Liberty also highlight contractors that worked on jobs the past year that went without any incidents. 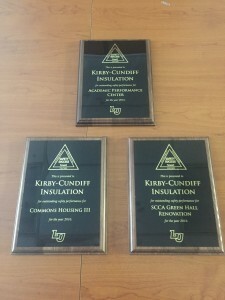 Kirby-Cundiff Insulation and Firestop of Virginia won multiple awards for their safety this past year. 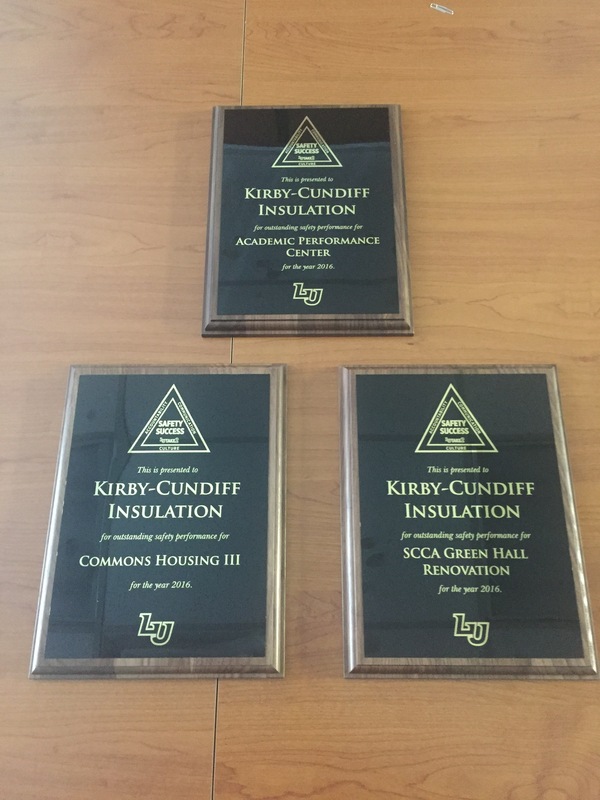 The Liberty Jobs were the Academic Performance Center (Firestop of VA & KCI), Commons Housing III (Firestop of VA & KCI), & SCA Green Hall Renovation (KCI). We are very proud of everyone’s hard-work in trying to promote a safe work zone for all of our employees. Our goal has been and always will be for our employees to return home how they left that morning. We appreciate all the effort that has been put into safety for our field workers and hope to continue our success. Becky Montgomery, Jim Lambert, Russell Ramsey, Kyle Matusevich, Carlos Portillo, Joseph Lambert, Gary Wright, Barry Wright, Michael Primm, James Palmer, John Brogdon, Kody Outhong, Steve Caudle, Randy Moorefield, Randall Dickerson Jr., Sam Sampson Jr., Danny Kersey Jr., John Harrison Sr., John Harrison Jr., Chris Walker-Wells, Robert Blankenship, James Tanaka, Kenneth Hubbard, Cody Flinchum, & Fred Guy.